Pridon's Hearth is Sargava's newest colony, pushing the country's borders further south than ever before and attracting treasure-hunters, fortune-seekers, and troubled souls hoping for a fresh start. But unnaturally powerful storms rock the tiny settlement just as the local lizardfolk tribe declares war on the colonists within. Are these threats somehow related? What became of the heretical cult of Gozreh that journeyed to the region a century ago, and do its corrupt teachings hold the key to calming the growing hurricane? Can the heroes protect the growing community from raging tempests and hostile monsters alike? And what role does the shadowy Aspis Consortium play in these recent dangers? These challenges and more await heroes willing to face down the Ire of the Storm! Designed for use with Pathfinder Roleplaying Game, this adventure is packed with excitement and unique personalities! Written by rising star Thurston Hillman, Ire of the Storm is a deluxe adventure for 1st-level characters, and includes 64 action-packed pages of tropical dangers, jungle ruins, and two new monstrous foes, plus a gorgeous double-sided poster map featuring the Sargavan colony of Pridon's Hearth and an exploration map providing an overview of the entire surrounding region. Players can expect to reach 6th level upon completion of this adventure—or wind up food for all manner of scaly menaces! Ire of the Storm is sanctioned for use in Pathfinder Society Roleplaying Guild. Ire of the Storm - Fantastic! This is one of the best modules / adventures I've played. I got the chance to play this module as part of a 24 hour fundraiser, so we played the entire thing straight through. As such, details are hard to come by. We had a full party most of the night (6 people) and still faced challenges and had fun the entire time. The NPCs made an impression throughout the entire adventure, spinning off multiple recurring jokes and helping to develop our own (brand new) characters. The setting was also great to play in - an area that hasn't been explored nearly as much as it could be. Update: I was able to play the module recently, albeit modified to fit into a more reasonable day. I think we completed it in about 11 hours, but we also had cut a number of the encounters. Exploration remains very long. I was glad that we cut out several sections for time. I had a much more in-depth post, but the website ate it. I ran this module as part of a 24 hour fundraiser event. Fort Breakthrough: Solid first level adventure, very engaging to the party. Est run time: 4.5 hours. Storm: Perfection. Very quick, but the players really engaged with the town in a way no other adventure ever has. The players absolutely loved Oyin and I loved how much a mundane cat added to the personality of the adventure. The subsystem was basically run over by the party of 6, who would have had enough successes for the best result even if they skipped everything after the skill check section. Est run time: 1.5 hours. Out of town: LONG! Probably two sessions of content. Some excessive filler, IMO, that didn't particularly advance the story (esp. the coral capuchin thing). Travel to set pieces means you have to spend a lot of time re-establishing what the players are doing. Weather was interesting for a while, but really frustrated the archer in the group. Est run time: 9 hours. Sky Tempest Temple: We were exhausted by this point, so I'm unable to be completely fair to the content here. The only thing that truly mattered to me was the MIREBORN LIZARDFOLK CHAMPIONSHIP! It was a hit with the PCs and it woke me up quite a bit after being about 18 hours into the module at this point, including our breaks. Daruthek's lair: I really can't be fair to this - we rolled up on this at about 19 hours in and the players could have bodied every encounter in here without much issue. Daruthek is really cool as a villain, but I felt like the encounter lacked a bit of oomph. That may have just been the tired talking at that point, though. Great module. Don't do it in one sitting like me. I was going to give this Module 4 stars due to the lack of Batman in the Module, instead of basing the review on the Lack of Batman. I will give it 5 Stars based on the writing and development of the Module. I ran this for my players as we took a break from Rise of the Runelords, It was a exciting to watch the players embrace the side quests and get attached to the NPCs. I wish I got a chance to play this before I ran it. It was a great adventure from beginning to providing a challenging but fun encounters. Played this with a good GM who took time to let us get to know the NPCs and context. Really great game! Some of the encounters are no joke though. This is my 1st review, posting here as saw it a pity, such a great product only 1 review so far. Two thumbs up! What is the definition of a deluxe adventure? I am just curious as to know if it differs from the new module format or if it is marketing lingo for awesomeness awaits inside. If so, bring on the deluxeness!!!! "Deluxe" is the term for the new, 64-page module format that includes a small gazeteer and (usually) a new monster or two. Do we know what level this will take characters to? Hmm... I like. Back to the region around Sargava will be fun. Will this be sanctioned for pfs? Anything to have another 1-2 module other than emerald spire would be great. Crossing fingers that it is sanctioned and evergreen :) We need more mods as Im running out of ones that I can play. Oi! Guess there's plenty o' adventure still to be had! BUT HE IS ALREADY HERE. The adventure itself will be 1-6, and should provide enough XP for players to reach level 6 once they complete it. Does "harrowing mysteries" hint at harrow decks and the like or am I reading too much into the choice of wording? You are reading too much into the wording; Sargava is about as removed from Varisia as you can get. But you're always welcome to lift some of the Harrow rules from Curse of the Crimson Throne or use the Harrow Plot Twist suggestions from Occult realms to give your PCs some direct and second chances. If you feel like borrowing the Crimson Throne harrow rules, I would highly recommend Wisdom or Constitution as the dominant suit for this adventure. I too am interested in such things. I will give this a good look. Updated with final description and product image! And yet another Module for 1st level PC's. I know! After years of nothing. Isn't it awesome? 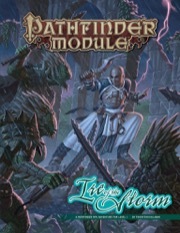 I'm glad to see Paizo remembering that all beginning GMs and players need content, too. I hope the recent dearth of low-level content is not revisited, as it has been a real struggle to get people interested in the game when they have nothing to play. Funny, and here I thought there was a great deal of low-level modules you can choose from. That most players have played to death. Not one of which is still in print. Meanwhile, I can still buy high level adventures as old as the 3.5 stuff Paizo used to make. When my distributors are out of every single 1st level adventure, including recent Adventure Path volumes, there is a problem. "The Godsmouth Heresy", "Murder's Mark", "The Dragon's Demand", "Risen from the Sands" (and "We be Goblins") are all still in print and available. I don't know why you can't get them, as even my local flagstore owner in germany keeps them in stock with no problem. But more 1st level adventures are always good because once you played the few available ones you need more. No, they are not. Distributors do not have them in stock, nor are they listed as an item that can be backordered. That means they are out of print. Paizo may still have copies, but they are not distributing them through retail channels any longer. Your store may have had an overstock of them, which I used to maintain as well. They're just all gone in the US, now. By the way: "Risen From the Sands" is not a 1st level adventure. It and "We Be Goblins" are also Free RPG Day modules, and not available through retail channels. 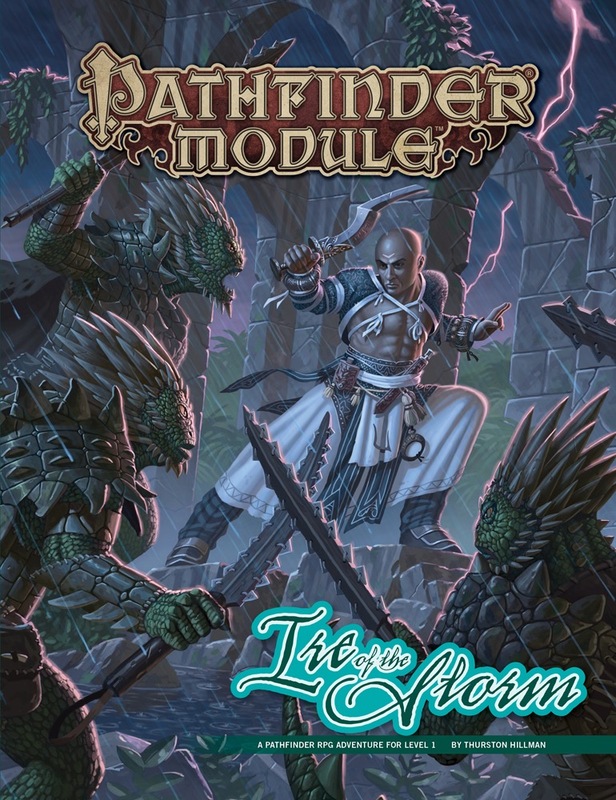 That is interesting to hear and of course you are right to want more entry level modules (and with what you said about Risen from the sands and We be goblins) . There were some people asking for a reprint of Crypt of the Everflame in conjunction with the re-release of the flip-mat classics: dungeon. The Godsmouth Heresy and Murder's Mark are also pretty old and only limited numbers of those remain in Paizo stock. But in november 2015 there were still more than 1000 of "The Dragon's Demand" in Paizo's warehouse. It is odd that they don't offer that module to retailers. I wish you a good business, Drogon. Let me join in the chorus of those applauding the creation of another adventure for low-level characters. As it will take characters to 6th level it looks to be more in the vein of The Dragon's Demand than some of the more recent modules. Don't take that as a complaint, I think that's awesome. I hope it will be sanctioned for PFS play either at release or shortly thereafter. I tidied my module collection the other day: modules starting at every level from 1 to 16, excluding 2 for obvious reasons. And they are all available still as PDFs. I like low level modules, too. Ire of the Storm looks great! I have to say that I miss - just a little - the smaller modules. Of course the 64 pagers are terrific because of the depth of content. The smaller jobers require less of a commitment and allow for something closer to sandbox play. Anyway, not complaining. Just typing out loud. This looks like a great module! A low lvl adventure but it allows players to get to sixth lvl. This and dragons demand allows players to really sink their teeth into the Pathfinder system without having to worry about an adventure path. I hope this is sanctioned as well. Of course, with hated Aspis Consortium about, why wouldn't it? I really love the cover art for this one! It has a "sword-and-planet" style pulp vibe! Then the stat block is correct -- whatever comes after the slash is what overcomes the damage reduction, not what it protects against. I thought John replied that it was going to be sanctioned soon after the release? The official release date is still two weeks away. What are the new monsters? Wondering the same as well. Its always nice to see new low level content. Its also always nice to see new adventures from Thursty. This looks awesome! I hope you get a chance to play it, and enjoy it.